The Western coast of Jutland, Denmark is dotted with abandoned German bomb shelters from World War 2 – and I clearly remember those shelters from when I was visiting our summer house by the coast as a child. With their looming, crumbling concrete-and-steel structures, often partly buried in the sand or halfway in the ocean, they seemed strange, mysterious – and to be honest, really creepy. I never got the chance to get a proper look inside them – but German sound designer and recordist Stephan Marche did, and now he’s captured the sound of them in a new sound effect library. Anyway, just in short about myself: I am a recording engineer and sound library designer with a passion. Since 2009 I’ve been running my own company called Detunized where I program instrument patches and develop themed sound libraries for royalty free use in music production, TV documentaries or simply to listen to. How did you come up with the idea for Abandoned Shelters? During my first stay in Denmark in 2010 I unexpectedly discovered all those bunker remains along the west coast. I was very impressed by the huge and massive concrete blocks that were spread along the beaches. Stepping into the bunkers I immediately felt anxiety and discomfort. I tried to imagine how it must have been for the soldiers that were based here during World War 2 and I was very lucky to be born many years later! Spending more time between the bunkers I also noticed the strong weather elements that are hitting the coast day in and day out. Even those massive bunkers showed clearly visible traces of destruction, burying and deterioration. Today some of them are lying far in the water or are almost completely sunken in the sand. Once again I had found another impressive example of the battle between mankind and nature, and I decided to come back with audio gear. This finally happened this September – and the stage was set for Abandoned Shelters – The Danish Bunker Coast. What sort of sounds did you expect to be able to capture inside those bunkers when you started the project? And did things turn out the way you expected? Remembering my previous visit I was expecting very strong surf and wind that’s always exciting to record. I wanted to find out how those sounds break through the bunker remains. But what I was looking forward most to hear (and record) are the sounds inside bunkers. Close to the exits you still hear the surf and wind, but the more you step in this changes to a heavily comb-filtered rumble that is still structured to distinguishable single waves and the undertow of water flowing back. Being completely inside you sometimes find deathly darkness and silence. There are some takes in the library where you can listen to nothing but some midges and my breath. Other bunkers have broken apart so that the wind streams through them and generates countless variations of airflow and gusts. Again some other bunkers openings are shortly above the water surface so that waves can break in. Due to the naked surfaces of concrete this causes wonderful bangs and you are literally surrounded by water without getting wet. How did you decide what bunkers to seek out – and how did you gain access to them? I recorded in 8 different areas. The Hanstholm Batterie, Vigsø, Lild Strand and Thyborøn are amongst them. The price I paid for these excessive sessions was to come back with almost 40 Gigabyte of two-track HD material. Anyway I always do it this way because it is better to decide at home what to keep and what to discard. The access to the bunkers is pretty easy as long as you don’t feel uncomfortable with darkness, humidity or dirt. There are no barriers or prohibitive signs around. It seems like that those bunkers are somehow accepted as part of the European history and removing them would cause way too much effort. I’ve been to the Western Coast of Jutland a number of times, but never been inside any of the bunkers. What does it look like in there? It looks naked. You are surrounded by concrete debris. I found out that all steel interior, the doors and guns were removed right after the end of the war and got quickly used for civil products. There are some traces to find but it is more rust than metal. 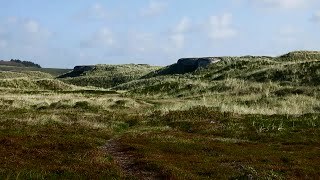 But I know that in 2008 a bunker in the north of Sønderby was excavated from sand during a heavy storm. The entire interior was still well preserved. What was your recording process and setup for the library? The entire library is recorded with a Sennheiser MKH30/40 MS-rig. Actually I wanted to use my newly-acquired SD 633 but after doing first shots close to erupting water and surrounded by sand I quickly reverted to my very trusty MixPre-D/Zoom H2n setup. I could better move and crawl with this handy rig. During post production I just applied some MS-EQing on some files in order to maintain image stability, especially in the low frequency range. What was the most surprising sound you captured – and do you have a favorite one? There are several but the most frightening I captured in Thyborøn. I arrived in dusk and it was very stormy so that it was impossible to record outside of the bunkers. I edged through a hole with my headlight slowly running out of power. After a while I reached a pretty voluminous room that was filled half with stones. It was pretty silent in there and I wanted to return – but suddenly the rumble changed and a huge wave came in. It was pretty silent in there and I wanted to return – but suddenly the rumble changed and a huge wave came in. I could clearly hear water pouring in and stones hitting against the bunker crown. I guess I have already been beneath the ocean surface and awaited a cold swap of water crashing at me. Luckily this didn’t happen. Any unexpected encounters while you were making the library? Yes, just let me praise the Danish Police! At early dawn I was recording in Hanstholm Batterie. I cowered in the back exit of a half sunken bunker and gathered gusts blowing through the undergrowth. Being fully concentrated I heard footsteps coming closer and suddenly a policeman appeared. I expected to get in trouble because of ignoring any prohibitory signs or whatever. But nothing of this happened. The policeman was very friendly and apologized for the disruption. He even asked if the sounds in this bunker were of particular interest for me or if I would mind to continue at another place. Then he apologized again and explained that they were about to hold an exercise in this terrain. In my home country I have made very contrary experiences during field recordings disrupted by authorities. You’ve got some really interesting ideas for sound libraries – like your Around Bridges library, Wind Turbines – and now this. 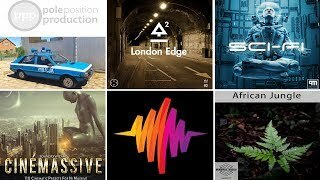 How do you come up with ideas for new SFX libraries? I always listen to my surroundings with open ears and mind. And I like to test different equipment which again yields new ideas. 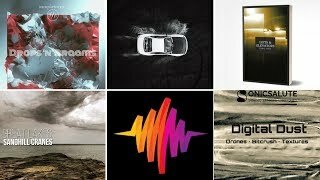 and grab the full 165+ minute pack of unique soundscapes for $55 ex vat here. Want more from Detunized? Explore the catalog here, subscribe to the Detunized newsletter here – and follow Detunized on Facebook here.